The 3 main steps in making an explainer video is script writing, storyboarding and production. In and around these steps are several important tasks that can make or break your video. Because they all build on each other, every step has to be done well in order to get good results. In this article we discuss storyboard descriptions, which are text descriptions of what the artist should draw. They are done after your script is approved and before the sketching artist gets to work. The reason this is a separate step from storyboarding is that coming up with a fitting illustration and drawing it are two different skills. The first is about "meaning" while the second is about "making it look good". Many people can be good at doing one of those things, but very few people are good at doing both! Storyboard descriptions for Facebook explainer videos are different from YouTube explainer videos because of Facebook's autoplay function. This means that instead of a thumbnail, most people are going to see the first scene of the video playing without sound, which means the first scene now does the same job that a thumbnail used to do. The first scene has to grab the attention of the viewer and tell the viewer what's in the video. For the hand-drawn explainer videos from MinuteVideos.com, we include a big title on the top left of the scene and then a single image that's as impressive as possible. The title has to be on the top left so that it can be drawn or faded in first. This means the viewer will know instantly if the video is interesting or not. If the title was drawn on the bottom right for example the hand will cover it when it's drawing anything to its top or left side, which is very annoying to watch. 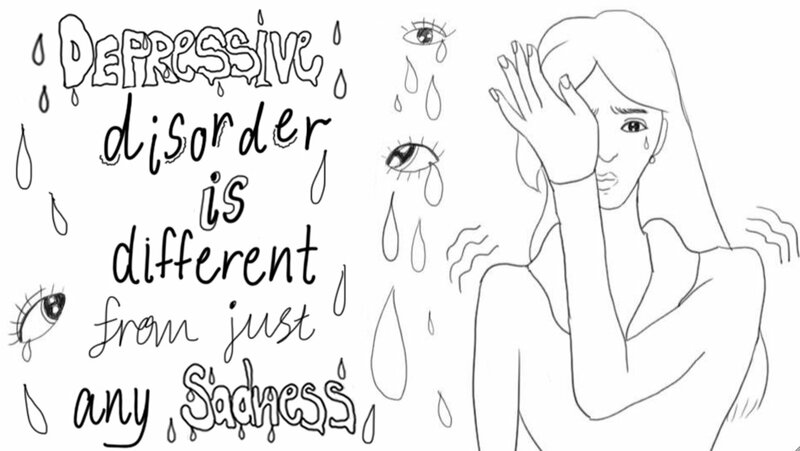 And here is the intro scene from our Symptoms of Depression video that does this quite well. Designing your introduction or "thumbnail scene" this way is extremely important. We believe that this can change the reach of your video by a factor of 10 or more. This is based on data from our Thai Facebook page with over 5 million organic video views. All of our videos that reached between 1-5 million people organically have been designed this way. All of our videos that did not have a thumbnail scene reached only between 50,000 - 300,000 people. Below you can see an example of an introduction scene that doesn't work because it jumps right into the information without a title and has lots of small illustrations (We only have this example with Thai writing). The reason this is so important is 2-fold. First, it makes more people notice your video, giving you a better view rate overall. Second, because you explain what's in the video people can make up their minds quickly if they want to watch it. So people who wouldn't like the topic anyways don't even start watching while people who would like it are more likely to notice your video and watch it. Because these people are also more likely to share your video you end up getting a higher share to reaction to view ratio. And that's very important. Based on our data, Facebook heavily depends on the number of shares, not likes, to decide if it is going to show content to more people. As a rule of thumb if your video has more shares than reactions, you're on track to going viral.. So in summary, it's really the title page that "makes or breaks" the success of your explainer video on Facebook. Facebook videos are also different than YouTube or Website videos for the other scenes because more than 50% of the people watch them without sound. This means that you have to mix enough text with the images so that the viewer understands the content. Sadly, you can't really use Facebook subtitles because then you have two things going on (images and text at the same time) and Facebook subtitles don't demand enough attention. To do this we recommend an additional step before you do the storyboard descriptions which we call "script reduction". During this step you cut out anything that's not absolutely necessary from the script and reduce what's left to bullet points. Most likely this will be the text that you will write in the scene. Of course some bullet points you can still draw as an image if it can be understood without explanation. 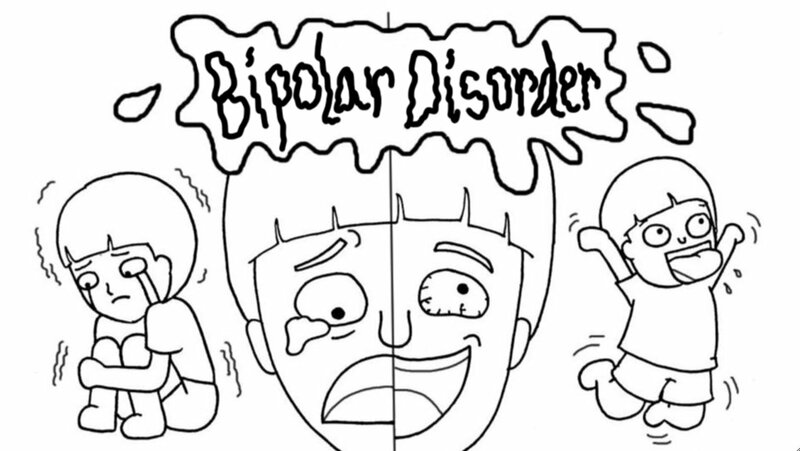 Below you can see two scenes from the Symptoms of Depression Video that do this well. Even though both of them could be improved by including a title to explain what the scene is about. 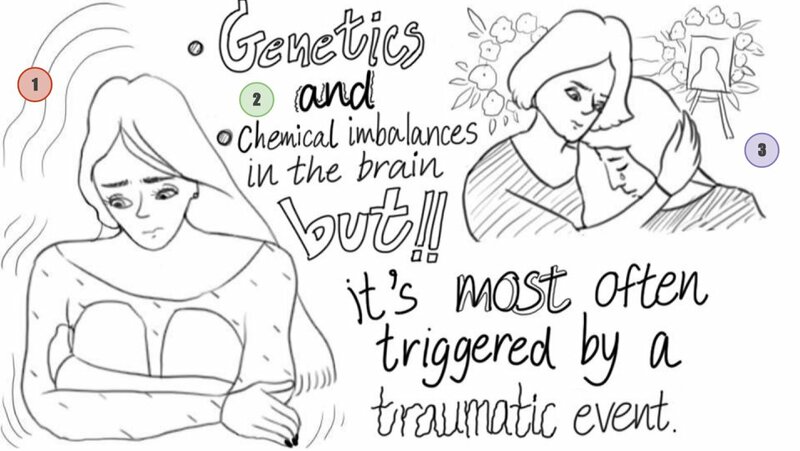 Depression can come from many different causes like genetics and chemical imbalances in the brain but it's most often triggered by a traumatic event  like the loss of a loved one or personal failure. Beyond the guidelines above, storyboard descriptions for Facebook should follow the other basic rules like they should be for YouTube or Website videos. 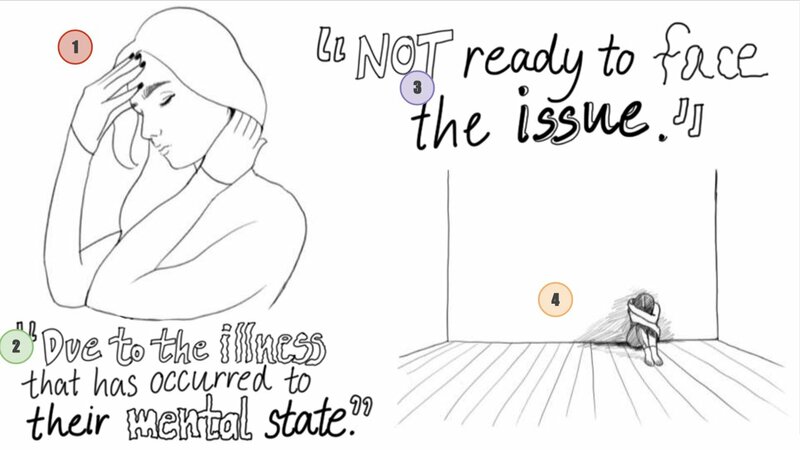 You can read about them on our Storyboard description guidelines for hand-drawn explainer videos article.